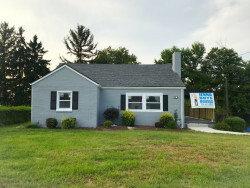 Super cute "Ranch"- style home, ready for a family. This home is for the person or family who wants a "move in ready" home that has been completely renovated! Modern updates, granite countertops, custom kitchen cabinets, stainless steel appliances, tile backsplash, and ceramic tile flooring into dining room. New dimensional shingled roof, double hung windows, and large deck for entertaining. We Are A Real Estate Investment Company. We buy and sell properties on our own behalf. We do not act as your real estate agent or broker. We buy homes, and we sell homes that we own. That means we are always acting as a principal in each transaction. At no point will we represent you during the sale or purchase of your home. We represent ourselves; you represent yourself. If you have additional questions on agencies, please contact your local real estate commission. © Revamp Realty, LLC All Rights Reserved.